"Our trip was a great success and, if anything, it has encouraged us to carry on travelling as much as possible. " My wife and I are extremely well travelled and we aim for around three or four trips away a year, now that we have retired. We’ve travelled extensively throughout Asia, and the Middle East, having been to Iran and Egypt in the past and most recently we headed to South America and enjoyed the sights and sounds of Rio Carnival and the breath-taking Iguazu Falls. Jordan really appealed to us as we have always thought of it as a very exotic place and it was on our list of destinations to visit in the Middle East. This trip was particularly appealing since it included both Petra and the Dead Sea, both ultimate bucket-list destinations. Our daughter happened to recommend Exoticca to us after seeing the website and we thought we would try it out as we are always looking for good deals with different holiday providers. On the day of our departure we were prepared for the long journey and for the initial shock of arriving in such an exotic place and as we walked into the arrival hall at Amman airport I could hear my name being called. At first, I wondered who was calling me but soon saw a friendly face and realized it was our driver ready to meet us. This made me feel at ease instantly and from that point on we were confident that we had made the right decision by booking with Exoticca. I can say it was definitely the exotic country I had in mind when I booked. It felt very different to Egypt and a lot more ‘old-world’, but we were prepared for it and with our guide, we felt like we were in safe hands. The food was very simple in Jordan, lots of meat, mainly lamb and chicken and lots of rice too and the best part of every meal were the beautifully fresh warm flatbreads, which were served throughout the country with most meals. They were delicious. The portions were very generous too, it would be difficult to go hungry in Jordan! Mr & Mr Koo outside the Treasury at Petra. Of course, one of the main attractions of Jordan is the lost city of Petra and let me tell you this did not disappoint. With all of these so-called ‘bucket-list’ destinations, you expect them to make you say ‘wow’ and leave you speechless, and we really were when we discovered Petra. 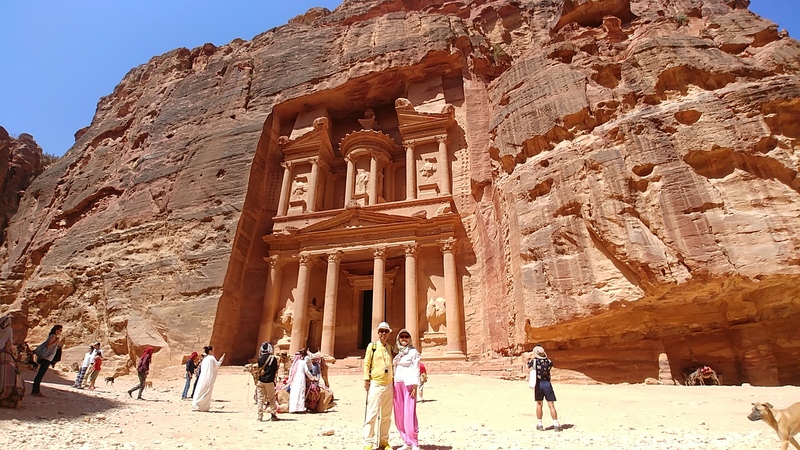 We saw the outside of the iconic treasury which was really breath-taking but the inside was not open to the public so our guide, took us to some lesser known tombs which were really fascinating and it was great to explore something different to the Petra you see in the holiday brochures. We opted not to take the donkey ride around the site and instead walked on foot and although it was quite tiring, walking allowed us to discover parts of the site that would have been hard to get to on a donkey, due to the steep terrain. Our visit to the famous Dead Sea was absolutely perfect, as there were only five other visitors on the day we were there and it was totally relaxing floating on the salty waters. Our guide had explained everything to us when we arrived, such as where to get the towels and leave your belongings, so we felt comfortable and were able to make the most of the experience. Without a doubt, the highlight of our trip was the night we spent in the camp in the Wadi Rum desert. 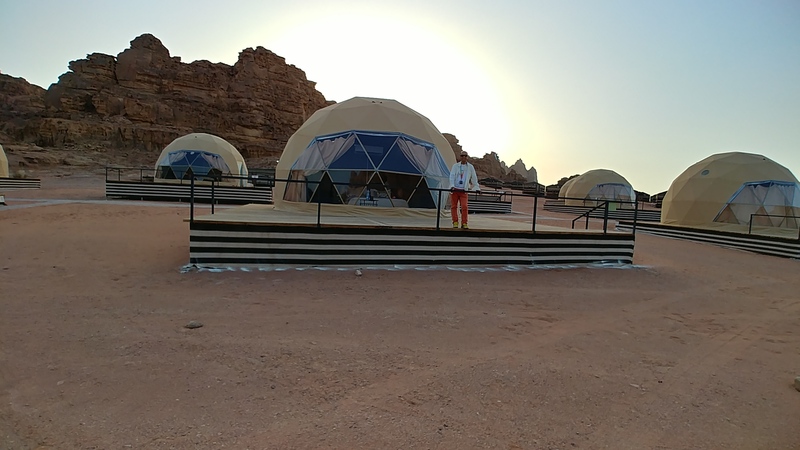 It was spectacular and it felt like we were Mars, the terrain was so other-worldly and the whole experience of sleeping in the desert was unique! It was my birthday the day after we arrived in Wadi Rum and I had told my friends back home I was camping in the desert so they all thought it would be very basic but when I woke up in the luxury tent on the morning of my birthday I sent my friends pictures to show them that it was a different kind of camping to what they had in mind and, of course, they were very impressed! The tents had amazing air conditioning and even normal toilets, so you did not feel as if you were in the desert at all, plus they had all the charm Middle Eastern charm that you expect. All in all, we thought the itinerary was perfectly organised, with the right number of excursions and we were not at all overwhelmed by the activities. We were lucky to have the guide to ourselves and this allowed us to be flexible. For example, we decided not to visit one of the castles near Amman and instead our guide took us into the city centre and we enjoyed lunch together and we got to experience a taste of authentic Jordan. We were able to explore areas we might not of on our own because we had a knowledgeable guide accompanying us. I had been enthusiastic to explore the city further and experience Jordan away from the main tourist sights and this was a dream that I was able to realise on this trip. Mr & Mr Koo in the Dead Sea. Throughout the holiday we felt very safe and everyone we met was so friendly and accommodating, particularly in the hotels. For example, we decided to opt for the Al-a-Carte restaurant one evening, expecting to pay the difference but the hotel let us choose from the set menu at no extra cost, and it was delicious! In Jordan, it is worth just asking if you need anything or want to change something because the people are so helpful. When we were shopping in Amman, a beautiful silk carpet caught my eye and we brought it to take home with us as a prized souvenir of our time exploring Jordan. Throughout Jordan, we noticed that the atmosphere was quite laid-back in comparison to other places in the Middle East that we have visited. In Iran, for example, there are strict Muslim laws in place and you can feel self-conscious, but in Jordan, it is much more relaxed and people were not as conscious about covering up. Our trip was a great success and, if anything, it has encouraged us to carry on travelling as much as possible. We are even thinking about re-visiting Jordan in the future to see the sights during the winter months. I would love to see Petra in the snow! Experiencing other cultures and going to places that are different to the UK is our main motivation for travelling and this is what this trip has given us. It was an eye-opening and wonderful experience that surpassed all of our expectations… just perfect! Henrique at Wadi Rum Camp. 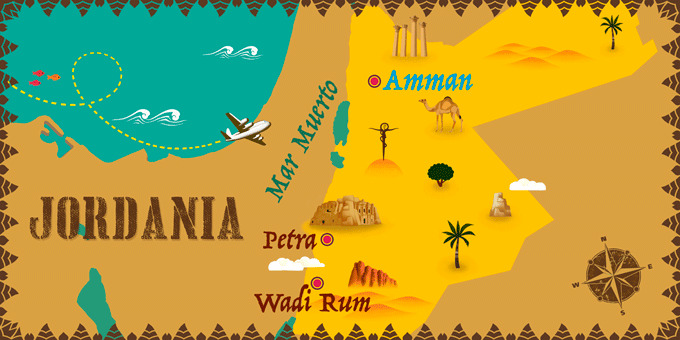 Jordan is home to a great number of biblical sites. From the Jordan River, where Jesus himself is said to have been baptised, Mount Nebo the location of Moses's death and the infamous cities of Sodom and Gomorrah.